A hundred Little Tokyo stakeholders gathered last Wednesday evening (8/5) to once again listen to Metro staffers explain why they shouldn’t be too concerned about the impact of the proposed connector that could run through the community, take out an entire block, jam up streets and land-lock business for four years during construction. Diego Cardosa, Metro bigwig, told the group that Little Tokyo needs to be a part of this 21st Century train system that will make Los Angeles a 21st Century City. OK. So we lose an entire block—one of only seven remaining in one of only three remaining J-Towns left in the U.S. Never mind that you can’t rebuild a 125-year-old community once it is destroyed. Because it takes another 125 years. The community has been chipped away by the World War 2 evacuation and incarceration; but we came back. Then the expansion of the Civic Center in the 1960s taking an entire block to build the LAPD Parker Center and Central Jail; still we hung tough. Then “redevelopment” in the 1970s that destroyed 1,000 units of affordable low-income housing, displaced many family-owned businesses and replaced it w/fancy businesses aimed at tourists from Japan who eventually quit coming to Little Tokyo; and the businesses who accepted the biggest offer, sold their properties and snuck out of town; but we’re still here. And here we are today, being asked to take yet another “one for the team,” so some hypothetical riders in the future can travel from Long Beach to Pasadena and not have to pay a transfer fare of $1.25 or have to transfer from one train to another--something millions of people do in public transit-oriented cities throughout the world every day. 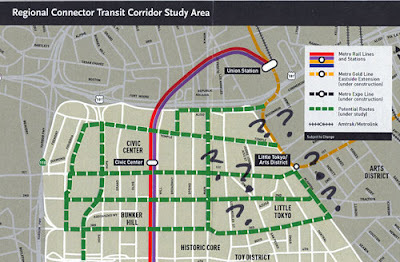 Or, as someone at the meeting pointed out, is Little Tokyo being asked to sacrifice in order to “fix” a gap in Metro’s original vision of “seamless travel “ that ineptitude or lack of foresight created? One entire block and maybe 20-30 family-owned businesses, who are already hanging on by a fingernail thanks to the current economy. So people don’t have to transfer trains? Buy a transfer ticket? To fix something that shouldn’t have been broken in the first place?